lot of handling and cleaning. The PTFE Frying Pan Liner is not only a convenient product, but also a very important cooking device that promotes healthier eating. It reduces calories because the liner enables you to cook without adding other fat or grease. Our company can provide different size , color and shape for you can imagine. our regular color is black , grey , brown and silver. When you buy a little big PTFE Frying Pan Liner, it can be cut with scissors by yourself. 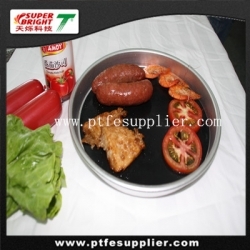 PTFE Frying Pan Liner is heat resistant from -60°C-260 °C, when we are cooking the food , the temperature usually ranges below 200°C, so it is very safe and healthy to enjoy bbq with liner.